This state’s major city, Georgetown, was founded by the British in 1786 as a trading center. Consequently, it attracted influences from not only throughout the Pacific but India and the rest of the world as well. This admixture of cultures continues to make Georgetown a vibrant culinary center today. These noodles are a common sight among hawker stalls, though derived ultimately from China and found elsewhere. The dish is unique in that it contains a slew of medicinal Chinese herbs. I wasn’t able to identify several of these positively, but a few are not too hard to find. Dong quai (Angelica sinensis) appears to be typical, as do astragalas, codonopsis, and Solomon’s seal. I was worried about the dosage though, so I offer a nonmedicinal version using only ginseng and goji berries, which are also commonly used. The noodles are called mee sua (misua), which are a very thin wheat flour noodle originally from Fujian province in China. Cut up the duck into sections, removing the breast meat and the thighs. Put all the other parts (use all the giblets except the liver), lightly salted, in a baking pan and roast for 1 hour at 350°F until brown. Pour off any fat and save for another use. Put the roasted bones and other parts in a pot. Deglaze the pan with water and pour that in the pot and cover with water. Gently simmer for 2 hours, skimming the debris from the pot every now and then. Strain through a cheesecloth-lined sieve, discard solids, let cool, and refrigerate in a container. When cold, remove any remaining fat on top of the container. You can serve up to 4 people if you use both breasts and thighs, but cook all the pieces and reserve for another soup later if you have fewer people. Sprinkle the pieces with remaining salt and pepper and fry these in a hot pan with reserved duck fat until the breasts are barely cooked through, and still pink, with the skin crisp. Remove them and set aside, loosely covering with a piece of tinfoil. Cook the thighs an extra 15 minutes until well done. Alternately, you can also slowly braise the thighs in the stock, but the breast meat will only dry out this way. To assemble, heat the duck stock and add the goji berries. Add a ginseng tea bag or another form of ginseng; if you use the tea bag, remove it after about 5 minutes. Slice the breast meat into thin slices, remove the bone from the thigh, and thinly slice the meat. Right before service, add the noodles, which will only take a minute or two to cook. Serve with slices of duck meat in the bowl and a sprinkle of green onion. 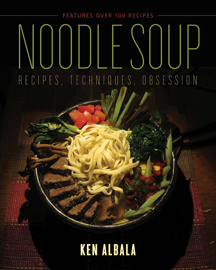 Find more recipes in Noodle Soup: Recipes, Techniques, Obsession by Ken Albala.